TURKEY: Power transmission system operator Teias issued 2.11GW in preliminary licences for 67 wind projects at the end of December, including a number of negatively priced sites. The latest licence issue completes a round started earlier in the year with the assignment of 710MW of so-called pre-licences. Pre-licences were issued to projects meeting certain criteria and participating in grid capacity auctions. Permitting must now be completed. Successful bids ranged from US$7.29/MWh assigned to three projects, to the -$2.87/MWh offered by PNE Wind for a 71.4MW project. Fifty-eight of the 67 successful bids were below $0/MWh. In practice, bidders awarded negative prices cannot participate in Turkey's feed-in-tariff system but must sell power on the free market and pay Teias the amount of their negative bid for the first ten years of operation. Project owners can supplement earnings for five years with local content price premiums. 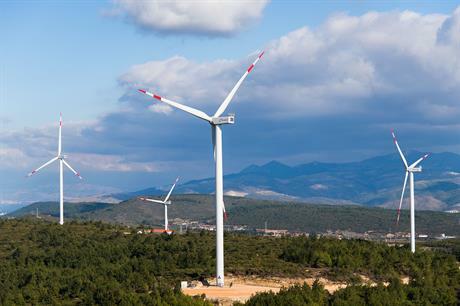 The 2.82GW in pre-licences issued by Teias in 2017 comes on top of the 1GW allocated in August to a consortium composed of Siemens Gamesa Renewable Energy (SGRE) and Turkish partners Kalyon Enerji and Turkerler Holding in a new "renewable energy designated area" auction system, known by its Turkish acronym Yeka. Turkey added over 700MW of new wind capacity in 2017, according to Windpower Intelligence. Its total wind capacity currently stands at approximately 6.8GW.